Mariah Carey, Cee Lo Green, Il Volo and other stars belted classic Christmas tunes against the backdrop of the iconic Rockefeller Christmas tree Wednesday night, ushering in the holiday season at the annual tree lighting celebration. Tens of thousands of bundled-up spectators braved 36-degree temperatures to catch a glimpse of the live performances at “Christmas in Rockefeller Center” and to witness the magic of 45,000 light bulbs flicking to life. "It's such an iconic event for New York and the whole country," said Bill Bracken, who produced NBC's tree-lighting show for the fourth consecutive year, and helped pull together what he called "a huge lineup this year." Musical performances ranged from Cee Lo's smooth take on "This Christmas," to Il Volo's soaring rendition of "Silent Night." The Radio City Rockettes in gold fringed leotards tapped and twirled to "Let Christmas Shine," drawing huge applause for their famous kickline. Rod Stewart in a Christmas red scarf and plaid blazer performed "Have Yourself a Merry Little Christmas," while the classically trained "Voice" star Chris Mann and his backup singers sang "O Holy Night." Mariah Carey kicked off the second hour of the show with her hit, "All I Want for Christmas," which was matched in energy by Scott McCreery's country-infused "Holly Jolly Christmas." 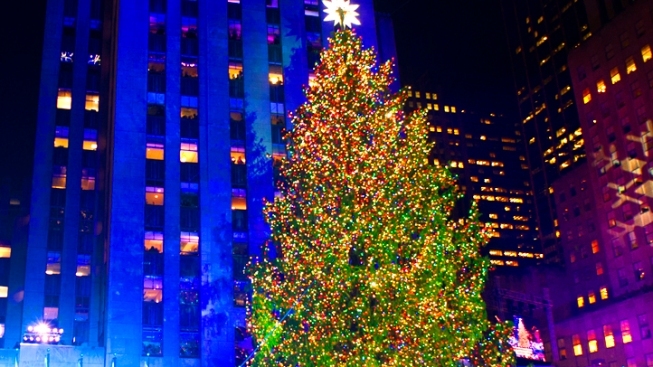 The broadcast, hosted by Al Roker and Savannah Guthrie, also featured performances by Trace Adkins and Victoria Justice and came to a close when New York City Mayor Michael Bloomberg, Rob and Jerry Speyer, CEOs of Tishman Speyer — the owner of Rockefeller Center — flipped the switch and lit the massive Christmas tree. First televised in 1951 on NBC, which makes its home in the complex, the tree lighting has grown to attract a quarter-million spectators and an audience of millions. This year's model, a Norway spruce from Morris County, N.J., about 50 miles west of Rockefeller Center, arrived on Nov. 14. The tree stands in the center of the plaza bound by 48th and 51st streets, and Fifth and Sixth avenues, looming 80 feet high, with a 50-foot waist and weighing 10 tons. The trees are typically donated by people from the tri-state area and New England. The tallest of all time was 1999's 100-footer from Killingworth, Conn. And Rockefeller Center is always looking for next year's version, so if you've got a tree measuring at least 75 feet tall and 45 feet in diameter that you think has what it takes to adorn The Rock, you can submit your tree for consideration. After Wednesday's tree lighting, the tree will be lighted every day from 5:30 a.m. to 11:30 p.m. until Jan. 7. After that, it will be put to good use: Since 2007, Rockefeller trees have been donated to Habitat for Humanity to be turned into lumber for affordable housing. Last year's tree was returned to Pennsylvania, where it was used to construct a pair of homes on Morse and Gratz streets in Philadelphia.